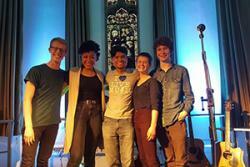 L-R: Sam, Diana, Irfan, Meinir, Josh.Bangor University students had an amazing opportunity to perform with a top contemporary-folk duo at the St Mary’s halls of residence recently. Nominated three times at the BBC Radio 2 Folk Awards, Gilmore & Roberts performed exclusively for Bangor University students at the recently renovated Acapella Hall which is located at St Mary’s Village. Students were selected as support acts following a series of ‘open-mic’ nights which were organised by the Campus Life Coordinators. Diana was accompanied by talented guitarist Sam Penrhyn-Lowe, 22, who has recently finished his Masters in Zoology and Herpetology. Also supporting on the night were Callahan, a band made up of Josh Smith, 18, from Colchester, first year, studying Zoology and Herpetology; Irfan Rais, 23, from Singapore, second year, studying Music and Creative Writing and Meinir Williams, 20, from Aberystwyth, second year, studying Welsh and French. Meinir said: “We all met through Bangor Uni Folksoc, and we play in the Folksoc sessions in the Greek on Wednesdays. We had all performed separately before, but decided to form a band just before Easter and our first gig was a Campus Life open mic event. We play folk music from all over Europe and beyond, from Welsh songs and tunes to songs in Swedish and Maori. We all play various instruments and sing and generally enjoy making music. Bangor University Campus Life Programme is run by the Residential Life Manager and Campus Life Student Crew for all residents of University Halls. The Campus Life programme is about coming together as a vibrant inclusive student community, and experiencing a huge variety of free fun activities and events, with like-minded people.